Technology, in multiple forms, is available and used in each classroom. Students have scheduled access to the Computer Lab for technology classes. 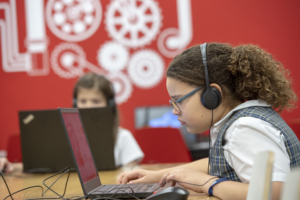 The technology teacher works in collaboration with classroom teachers to provide digital options for projects, inter-active games corresponding to curriculum, and online assessments. All students have computers, chromebooks, and iPads available under the guidance of a Technology teacher. Students are trained in basic computer usage skills (i.e keyboarding, file sharing/saving, content creation), and increasingly sophisticated yet safe use of educational software/web-based programs from using word processing tools to beginning coding. Students leave Providence equipped with a technology portfolio, and know what it means to be a competent 21st Century Digital Citizen.